Nobleboro is located in Lincoln County in mid-coast Maine. It is accessed by Route One and is located between the towns of Damariscotta and Waldoboro. This predominantly residential community of 1643 people (in 2010 Census) retains its rural character. It has great natural beauty, with lakes, vast woodlands, and the expanse of Great Salt Bay at the head of the Damariscotta River. On the shores of Damariscotta Lake, Pemaquid Pond and Duck Puddle Pond are summer homes for hundreds of cottage owners and renters. The town was first settled in the 1720’s when the British Crown sent Colonel David Dunbar to rebuild the fort at Pemaquid. With that prospect of security, other settlers would, it was hoped, be attracted to the area. Colonel Dunbar built his home "Belvidera" (Beautiful View) on a point of land overlooking Great Salt Bay. By 1788 the settlers in the area, then a part of the Walpole plantation, were ready to make the settlement official. 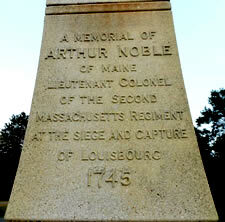 Leading this effort was Arthur Noble, Jr., son of Lieutenant Colonel Arthur Noble, commander of the second Massachusetts Regiment in 1745 during the siege and fall of the fortress of Louisburg on Cape Breton Island. He was commander of many men from the Province of Maine. 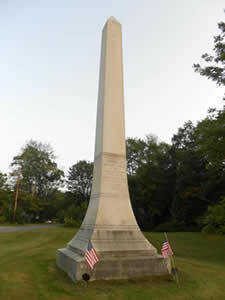 The monument in Nobleboro Center, located across from the First Baptist Church, was erected in his honor. The Town of Nobleborough was incorporated November 20, 1788. The tract of land that initially comprised the town then included most of what is now the town of Damariscotta. This area was set off from Nobleborough and became a town in its own right in 1848.